The use of herbs in cooking adds color to your dishes and disease-fighting antioxidants to your recipes. Herbs also add flavor to foods without increasing salt, fat or sugar contents. However, once harvested, fresh herbs have a relatively short life of only a few days in the refrigerator. To preserve herbs for extended use, there are two methods: freezing and drying. Having frozen and dried herbs on hand adds convenience to food preparation, as they can be a substitute for fresh herbs. Freezing herbs slows the growth of microorganisms that cause food spoilage. While freezing does not completely destroy these microorganisms, it does significantly slow their growth, allowing food that has been properly frozen to be safe to eat. It is important to note that once frozen foods have been thawed, microorganisms will continue to grow, so safe food-handling practices are required. Herbs should be frozen at their peak freshness for best results. When comparing different food preservation methods, freezing is the method that preserves the most nutrients due to reduced processing. Although frozen herbs may be safe to eat after a year or longer, it is recommended that they be used within 3–6 months for best quality. Keep your freezer at 0°F. Keep a thermometer in the freezer to monitor temperature. Herbs will have textural changes after being frozen and thawed, due to the expansion of water during freezing that causes cell walls to break down. Therefore, herbs that have been frozen may be better suited for use in cooked dishes, rather than as a garnish or in uncooked dishes. Freeze whole or cut herbs quickly by spacing them out and placing them on a cookie sheet in a single layer, allowing the cold air to reach more of the surface area of the herbs most quickly. Place the cookie sheet in the freezer for approximately 2 hours. Alternatively, you may instead chop herbs into small pieces and place pinches of them into ice cube trays, cover them with 1-2 tablespoons of olive oil or water, and freeze. 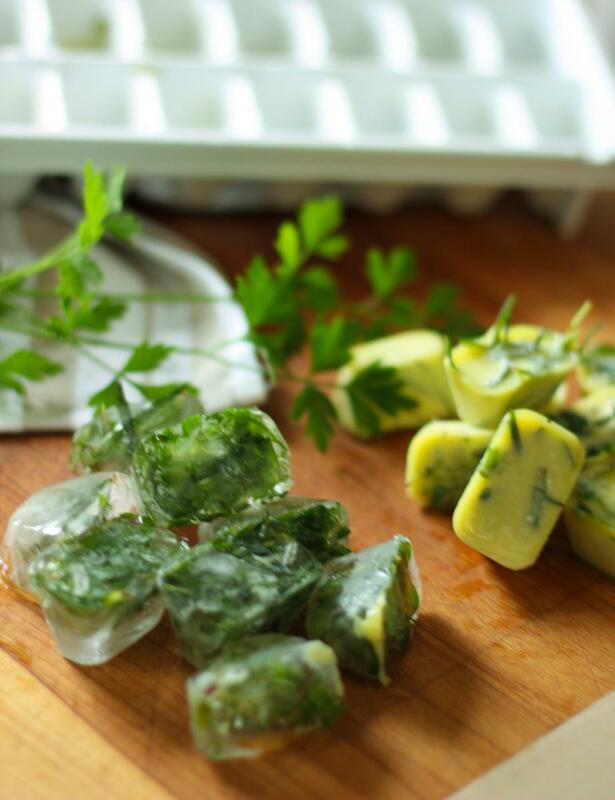 Once frozen, the herbs or frozen cubes can be placed into a freezer-grade container or bag for storage in the freezer. When packaging them into bags or containers, make sure to push out all excess air to avoid freezer burn. Due to high water content, when herbs are frozen they tend to expand. Always leave some extra space, or “head space” in the package. Label packages with the name of the herb and the date it was packaged. If herbs are frozen solid, bags or containers can be stacked in the freezer. Avoid overloading the freezer with unfrozen foods, which may raise the temperature. When moisture is removed from foods, microorganisms cannot grow and cause spoilage. Drying slows down the action of the enzymes (substances that cause foods to ripen), but does not stop them entirely. Low humidity promotes the process, thus Ohio weather is not always conducive to drying. For all drying methods detailed below, begin by rinsing the herbs under cool running water, and shake to remove excess moisture. For all drying methods, times and temperatures will vary. You will need to monitor herbs in the drying process to recognize when they are dry. They are dry when they crumble easily between your fingers, or when the stems break when bent. Dried herbs may be three to four times stronger than fresh herbs, so if using dried herbs to substitute for fresh herbs in a recipe, decrease the quantity to one third or one fourth. You can check the potency of dried herbs by rubbing a small amount in your hand. If the scent is fresh and rich, the dried herbs still have flavor. Dried herbs can be kept for up to a year for best quality. Store dried herbs in an air-tight container, labeled with the name of the herb and the date packaged, in a cool, dry, dark area to protect their color and fragrance. Place up to five single layers of herbs separated by paper towels on an oven tray. Turn on the light of an electric range or pilot light of a gas range and place the herbs in the oven for eight hours or overnight with the heat off. A conventional oven does not have a fan to help circulate the hair. For air circulation, leave the oven door propped open 2 to 6 inches. You may place a fan near the open door to help improve air circulation. Most convection ovens use a fan to circulate air, making them a better choice for drying. Some convection ovens will not run the fan unless the door is closed. If this is the case, drying should still be effective with the door shut. Stack trays so that there are at least 3 inches of clearance at the top and bottom of the oven and 2½ inches between trays. 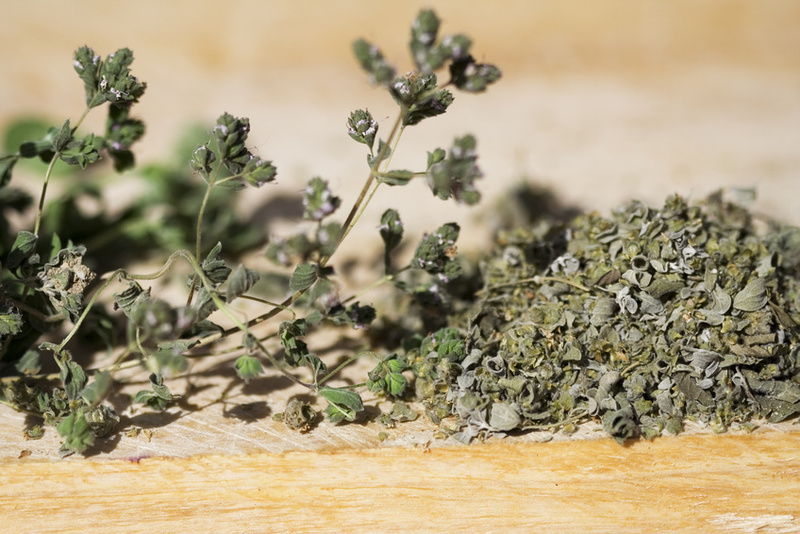 Herbs dried in the oven may be darker, more brittle, or less flavorful. Microwave drying is the fastest method for drying herbs in small quantities. Follow the instructions that come with your microwave oven, as the wattage of your microwave will affect drying time or power settings. 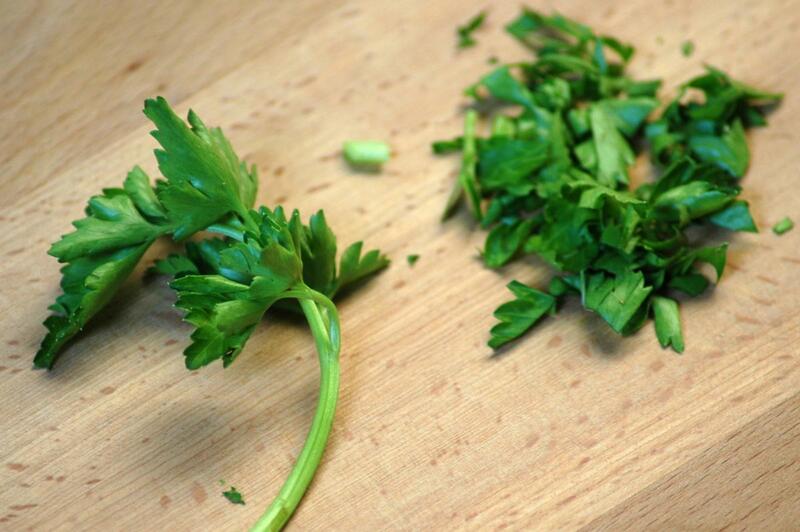 If you plan to air-dry herbs, cut the herbs before they go to seed. Tie the stems into bundles and hang indoors in an area with low humidity and good air circulation for best results. 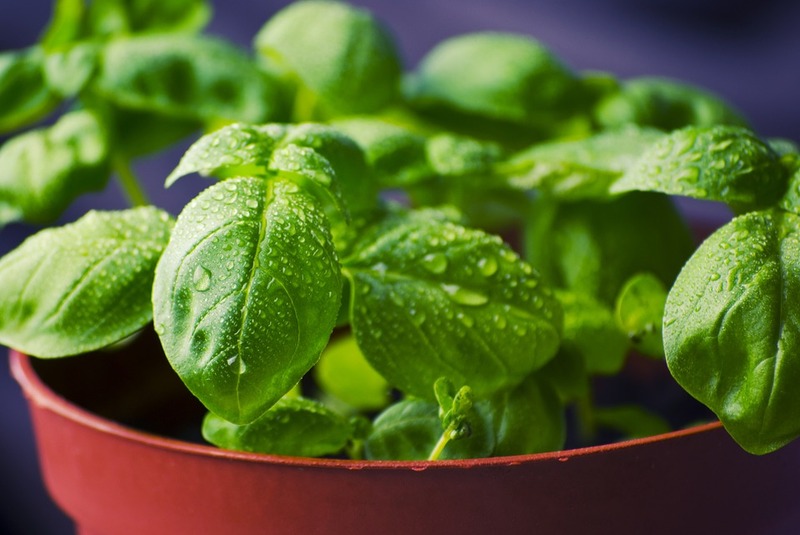 Avoid hanging herbs in areas with high moisture levels, such as near the dishwasher or sink. The time that it takes for air-drying to fully dehydrate herbs will vary greatly depending upon the herb, the weather and other factors. Herbs are dry when they crumble when touched. Dry herbs in a dehydrator set at 95–115°F for 1–4 hours. Herbs are dry when they crumble and the stem breaks when bent.